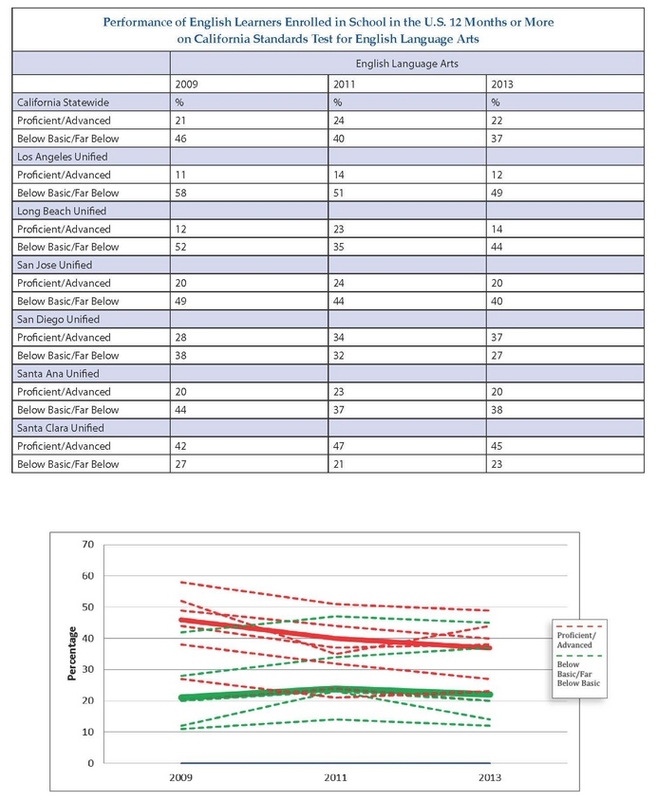 Click here to download printer-friendly PDF.California public schools have not, for the most part, had much success increasing proficiency rates for most English learners. This has been the case in both English language arts and math for most students, and particularly over the past five years.The rate of those third-grade English learner students who have attended U.S. school for 12 months or longer testing at proficient or higher in English (51 percent) and math (21 percent) in 2009 was virtually the same in 2013 (51 and 22, see table below). The changes in outcomes were comparable to those for the overall student population, for whom English language scores declined slightly at most grade levels this year. Statewide, all third grade students scored at or above proficient in English at a rate of 46 percent, the same as in 2011 and up from 44 percent in 2009. In Los Angeles Unified, California’s largest school district, the overall third-grade student population increased its rate at or above proficiency to 40 percent, up from 34 percent in 2009. In recent months, prominent Latino advocacy organizations, including the League of United Latin American Citizens (LULAC) and the Mexican-American Legal Defense and Education Fund (MALDEF) have issued strong statements in support of robust assessment systems that include English learners in testing, to strengthen the accountability for their schools to provide quality education to all students. To be certain, this is a student population whose success can be complicated by a great many factors. Teacher preparation, funding levels, immigration patterns including levels of prior educational attainment, and degrees of poverty are among those most frequently discussed. Meanwhile, there has been some meaningful progress across California at the lower end of the achievement spectrum. The rate at which this group of EL students score at the lowest achievement levels, called Below Basic and Far Below Basic, in English Language Arts has declined substantially, from 46 to 37 percent over the past five years. Among those school districts with the largest English learner populations, San Diego Unified had the greatest success in this regard, reducing the percentage testing Below Basic or lower from 38 percent in 2009 to 27 percent in 2013. The Los Angeles and San Jose Unified School Districts both matched the statewide rate of gain. The state system defines Below Basic or Far Below Basic performance levels on the California Standardized Tests as representing, “a serious lack of performance. Students demonstrate little or a flawed understanding of the knowledge and skills measured.” Proficient performance is defined by the state Board of Education as “a competent and adequate understanding of the knowledge and skills measured.” But these gains moving students to basic skill levels was not matched above the proficiency line for English Language Arts. In Los Angeles Unified, the 11 percent at or above proficient in 2009 had grown, but only to 12 percent in 2013, after rising as high as 14 percent in 2011. In San Jose, the 20 percent of third-grade EL students scoring at or above proficient in 2013 matched the 2009 total. • The statewide rate at which English learner students were redesignated to English proficient status was 12.2 percent in 2012-13. The rate represents small, steady growth since 1997-98, when supporters of Proposition 227 pointed to a 7.0 percent redesignation rate as evidence of a segregatory and exclusionary bilingual education system. This rate briefly rose as high as 16.3 percent in 2011-12. • Students who began school as English learners but attained English skills adequate to be reclassified as proficient in English were once again among California’s top-performing students, with 72 percent scoring proficient or advanced in English, and 91 percent in math, compared with 57 percent and 74 percent, respectively, of native English speakers. • The size of this population, as a percentage of all California students, has fallen slightly but steadily over the past decade. In 2003, English learners who have attended U.S. schools for at least twelve months comprised 32 percent of all third grade students. In 2013, they accounted for 29 percent. California is home to nearly one-third of the nation’s English learners. With California having adopted the Common Core State Standards, state education officials note that this was probably the final year that the current Standardized Testing and Reporting (STAR) assessment system will be used. Tests aligned with the new standards and administered on computers, rather than pencils and paper, will be used beginning in the 2014-15 school year. The California State Board of Education in November 2012 adopted new English Language Development Standards. The standards provide an essential foundation for curriculum, effectively structuring English instructional programs. The new standards were supported by leading advocacy organizations for English learners, including the MALDEF, as well as stakeholder organizations like the California Association for Bilingual Education and the state school boards association. of students. These rates remain unchanged since 2008. In April, a lawsuit filed by advocates alleged that tens of thousands of English learners, roughly one out of 50, were not receiving any of the English language services which they were entitled by law.